We are very committed to what we do, throughout the value chain we work every day to maintain and improve the quality we are known for. We are continuously striving to be in forefront with knowledge and new technologies in spring manufacturing. It all starts with the Drawing and a Quotation. First the Drawing is verified by our Engineering department, in order to secure the optimal spring solution for our customers. In some cases alternatives will be offered, due to the highly specialized skills of our engineers. Due to our setup, we closely follow the forecasts from our customers, and have a close dialogue with our customers' purchase and planning departments, and we are taking action on deviations on the ordering pattern from our customers. Traceability: we can always go back and find statistic data from the final spring through the different processes back to the wire delivered from our suppliers. 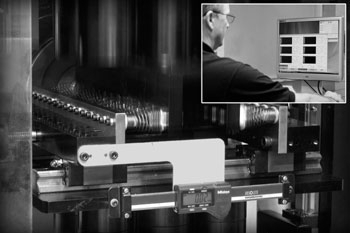 Fatigue tests: Fatigue tests of springs are continually carried out in order to secure the processes, the materials and by changing of designs, this all equal cost efficiency for our customers. Measuring: We continually use very exact optical measuring in our daily work in order to assure the high quality standards from our customer. Machinery: We constantly invest in our machinery, in order to stay competitive on the world market and still deliver the uniform quality we are known for. Delivery on agreed time: We deliver 99,04 % on agreed time, and our committed goal is 100 %. Failure rate: As a committed goal we have set 100 PPM as our failure rate and we are working every day to secure that we meet the goal. 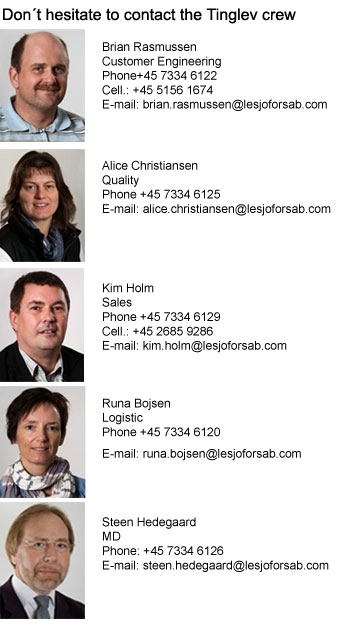 You have now received a Newsletter from Lesjofors. We are sending four newsletters per year where we introduce you to our products and services, comment on the market and anything else which is nice to know about Lesjofors Tinglev. Very recently, Lesjöfors Tinglev arranged a Spring Seminar, this time with primary focus towards construction engineers. It was a very informative afternoon, where we introduced the participants to the world of spring manufacturing and calculating. Due to limited space and our aim to offer the participant best possible content, we were not able to invite all interested, and therefore we will arrange another Spring Seminar in the late summer. The exact date and invitations will be sent out not before long. Lesjöfors is a global manufacturer and supplier with the market’s widest range of springs, gas springs and strip components. Our success is the result of years of dedicated work and research into innovative problem solving across a range of major and diverse industries. Our experience, along with our unique skills, access to resources and focus on continuous development processes delivers high tech customised solutions for every need. Lesjöfors has factories or sales offices in many European and Asian countries: Denmark, Sweden, Norway, Finland, Germany, Great Britain, Holland, Belgium & Luxemburg, Latvia, Estonia, Russia, Korea and China.